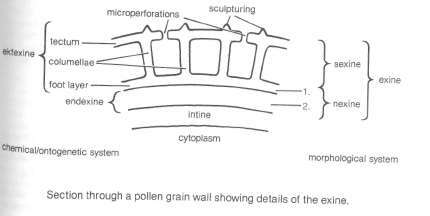 The outer part of the wall of a pollen grain external to the *intine. Several alternative systems exist for recognizing different layers in the exine (see diagram). In some morphological systems it is divided into an outer sexine and an inner nexine. Other systems based on chemical differences recognize an outer ektexine and an inner endexine. Various projections of the exine surface may confer a characteristic sculpturing to the pollen grain. This sculpturing, together with information on pollen size and shape and the positioning of the germinal apertures, can be so distinctive that individual genera and even species can be recognized. The exine is composed of a carotenoid polymer called sporopollenin, which is highly resistant to decay. This has enabled palynologists to study fossil pollen and deduce the composition of earlier floras. Such studies have also thrown light on the evolution of plants.